(Photo by Darren Andrew Weimert) There's something special going on in Millheim, even as time seems to stand still. (Photo by Darren Andrew Weimert) Tim Bowser (left, with brewer Tim Yarrington) wanted Elk Creek Cafe & Aleworks to be a place where people could be together and enjoy each other's company. 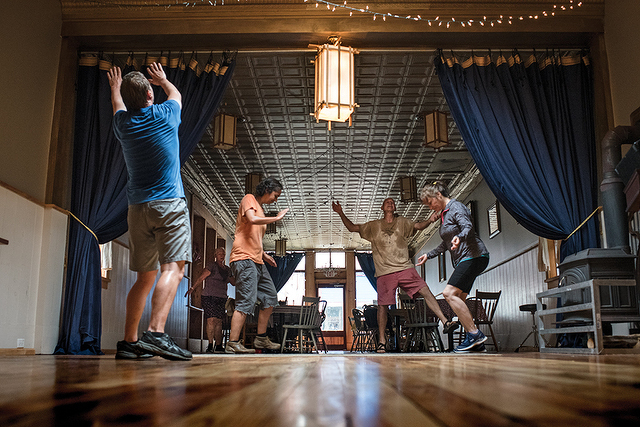 (Photo by Darren Andrew Weimert) "Dance church" at the Bremen Town Ballroom. Something special is happening in Millheim, and you can feel it on the streets. Well, maybe it is more that you can feel it on the street, because, really, there is only one major road through town. Millheim is a small community of around 900 people. But on that street in this rural community in Penns Valley, there really is something happening. You can feel it in the brightly painted mural outside of The Elk Creek Cafe & Aleworks. You can feel it in the storefronts filled with small businesses. With an art gallery, a coffee shop, a wine shop, and a meat market, this is a town that is bustling with life. 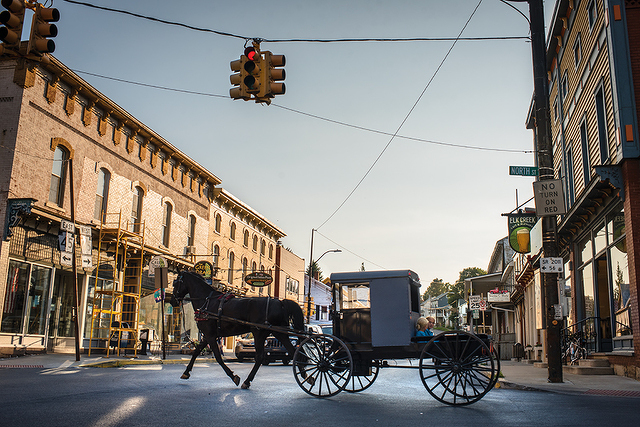 You can feel it in the click-clop sounds coming from the horse pulling an Amish buggy down Main Street. And you can feel it up in the scaffolding as carpenters repair old buildings, giving them new life. If you haven’t been out lately to the small town on Route 45, about 30 minutes from State College, it’s worth the trip. And if you have taken that journey, you know the magic that is in the air. There are no televisions in the Elk Creek Cafe & Aleworks and after a work day you can find a mixed group of people doing something that is a novel idea these days: talking to each other face-to-face. All week long people flock to the place for the food, the beer, and the community. A young fisherman from out of town might pick up a conversation with a farmer who has lived in the valley his whole life. A young couple who came from State College for dinner might listen as a grandmother from Spring Mills talks about what Millheim used to look like. Weekends often highlight a bigger-than-expected musical act or a pop-up beer garden. Owner Tim Bowser wanted his brewpub to be a place where people got together and talked. Political debates, farming updates, and arguments about music, along with neighborhood gossip, all seem to be part of the conversation surrounding the warm wooden bar, so it looks like he got what he was looking for. CLICK HERE for an aerial view of Millheim. Bowser remembers stopping at the historic Millheim Hotel years ago for the pizza they served, and thinking that if there was a good product, people would come out. The hotel is still drawing a crowd, but the Elk Creek has carved a whole new niche. The main dining room at Elk Creek is surrounded by huge windows that let in an amazing glow of light that highlights a rotating gallery of artists on the wall. Over the course of a meal it is not uncommon to see an Amish buggy pass by, nor is it uncommon to see political activists rally on the street outside. Beer lovers flock to the pub, and foodies come to taste the locally sourced food, with the farming community of Penns Valley providing many of the main ingredients. “What I learned when I started looking into starting a brewpub is that some breweries are good at beer and some are good at food. We wanted to be good at both. I thought if we could do that, people would make the journey to come here,” Bowser says. It has changed the town. 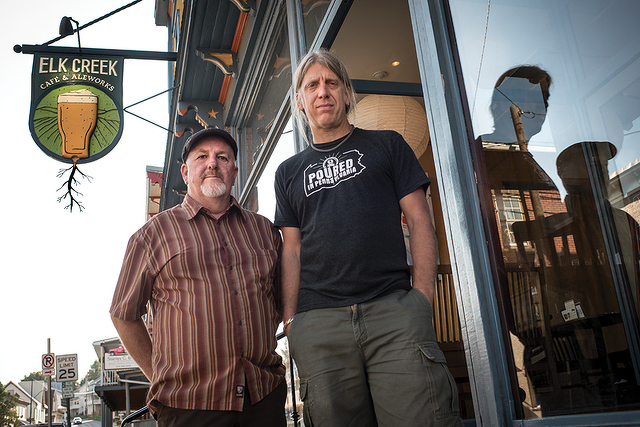 (Photo by Darren Andrew Weimert) Tim Bowser (left, with brewer Tim Yarrington) wanted Elk Creek Cafe & Aleworks to be a place "where people could be together and enjoy each other's company." It is odd that a town of 900 people has an art gallery. But the Green Drake Gallery and Arts Center is a big part of life on Main Street. With a gallery open on the weekends, Karl Leitzel uses the center to provide a home base for a thriving arts community. Leitzel grew up in next-door Aaronsburg. 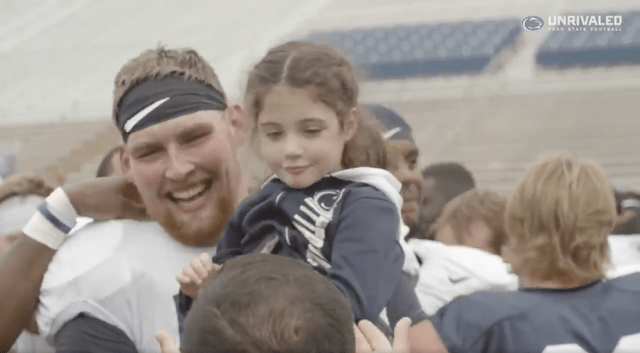 Leitzal credits the area’s natural beauty along with its location between Penn State and Bucknell universities for attracting educated and artistic people. The beauty of the area is hard to match, Boyer says. Fly-fishers come from around the state and even the country to fish in its steams, and a natural spot to stay is in the heart of Millheim. The Penns Valley Conservation Association has made it a priority to keep that area as natural as can be. PVCA director of operations Joshua Brock says Penns Valley has some of the best fishing in the area. Larry Wolken remembers when the radio meant everything to him. After living in Washington, D.C., for many years, he noticed something was missing when he moved to Penns Valley with his family. WSOV-Sounds of the Valley fills that void. Wolken, general manager of the station, understands that in today’s world of podcasts and internet radio, the idea of a local station broadcasting on radio waves might seem as quaint as a milkman to some people, but maybe that is why it fits in with the valley. And while all those other outlets might offer a view to the world that is important, a local radio station gives the community something different. Soon the station will be streaming online so the sounds of the valley can be heard around the world. You can’t help but feel at home at the IngleBean Coffee House. The log cabin-type atmosphere calls out for a person to come in to grab a cup of coffee and relax. It feels nice and welcoming and fun. That is just the kind of vibe that owner Dennis Alan is going for. Alan came to the valley after living in New York City for years. Fed up with the hustle and bustle, he moved to Millheim in hopes of “homesteading” in an area that he calls among “the most beautiful in the county.” He loves the small community where he can get to know people, and that is why he is glad to be in charge of the Inglebean. The space now offers an open mic night on Fridays that brings many local musicians and entertainers in to celebrate. All morning long, people stop by for coffee and talk. “I just fell in love with this area. The people, it is special. I want to keep that going at the shop, this small town community of people who care about each other,” Alan says. “Time kind of stands still here,” Boyer says. And he is right. There is something quaint about seeing a butcher in the heart of town. Known for its homemade smoked products and freshly cut meats, the Penns Valley Meat Market has been serving customers for 42 years and has seen the town change. “It is great, all the things that Elk Creek has done for town. It brings in people. There used to be a lot of empty storefronts. Now look at it out there. It is busy,” says market co-owner Nathan Bierly. Bierly remembers running around the store when he was 6 years old and says things in the meat market remain the same as ever. Accepting only cash and keeping things simple allows the market to keep costs down. Across the street is a candle shop. On another block is a barber, next to a fireplace stovetop store. Up from town a short way is Hosterman and Stover, a hardware store that has been in the area for more than 100 years. People travel from all around to stop at Burkholder’s Country Market to find down-home foods that they might not be able to get other places. The grocery store is a baker’s dream with bulk products, and co-owner Russ Burkholder says the hot food bar is as popular as ever. With many young Amish cooks and bakers, the store offers home-style fare that is hard to find anywhere else in the county, Burkholder says. It is hard to believe that Bremen Town Ballroom used to be the home of a rowdy bar. The historic space on Main Street was renovated by Joshua and Erin McCracken, who now run their catering business out of the kitchen in the back. The ballroom serves as a meeting place, housing farmers markets, workshops, town meetings, along with live music and other events. With a rustic but elegant feel, the ballroom is a great mix of Millheim old and new. After traveling around the United States as a musician, Erin McCracken found Millheim as the perfect place to settle down, raise their children, and start a business. “There is so much music here, so many great artists. I don’t know how that happens, but it did,” McCracken says.